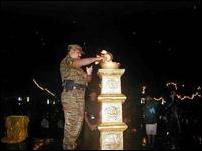 Liberation Tigers' Trincomalee regional military commander Colonel Pathuman lit the flame of sacrifice at the main event of the Great Heroes Day celebrations at the Alankulam Heroes' cemetary in the Muttur east in the Trincomalee district amid heavy shower and large gathering of people soon after the address to the Tamil people by LTTE leader Mr.V.Pirapaharan Thursday evening. Earlier parents and relatives of the LTTE martyrs were honoured at a meeting held at the Chenaiyoor Central College in the Muttur east Thursday afternoon. 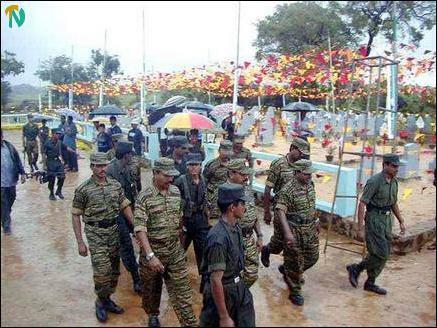 Thereafter they were taken in a procession to the venue Alankulam Heroes' cemetary with LTTE band group in attendance. With Colonel Pathuman, LTTE Trincomalee district political head Mr.S.Thilak, district women political wing head Ms Kaaronja and several leading LTTE activists in the district participated in the event. Addressing the parents and relations of the LTTE martyrs earlier in the day Colonel Pathuman said successive governments led by major Sinhala political parties had entered into peace talks when they realized that the war with the LTTE could not be won. The current atmosphere of peace prevails because of the sacrifice by thousands of LTTE martyrs in the Tamil freedom struggle. "Our military might has made the governments in the south to launch peace talks with us," said Mr.Thilak. LTTE district women political head Ms Kaaronja also spoke.